Earlier this month LECIP presented an exhibit in connection with the APEC Japan 2010 Small and Medium Enterprises Ministerial Meeting in Gifu. In the Gifu Miyako Hotel, directly adjecent to the SME Ministerial Meeting site, the Gifu Prefectural government office organized a PR exhibit showcasing to Asia-Pacific government officers both industrial activity and traditional arts in Gifu. 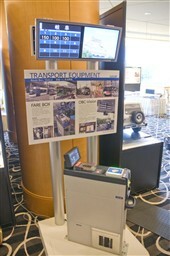 The LECIP booth showcased the systems it has developed for route buses and drew the interest of many attendees in related government and industry positions.